The Dallas Cowboys are not supposed to be where they are right now. After going 4–12 last year, then losing both quarterback Tony Romo and his backup to injuries during training camp, it looked like Dallas was going to be in for another long season. Yet the Cowboys have the best record in the NFL and were the first team to clinch a spot in the playoffs. And it’s all mostly thanks to their new leader, quarterback Dak Prescott. Although he plays like a veteran, Prescott is a rookie. He wasn’t even a high draft pick. He was the 135th overall pick, taken at the end of the fourth round. Every team had several chances to take him and didn’t. Six other quarterbacks were drafted before the Cowboys called his name. And Dallas even took four guys before him, including a player who they knew would miss this entire season with an injury. Prescott threw his first NFL pass to Dez Bryant, and the QB didn’t throw his first interception until his 177th pass. That set an NFL record for the most passes without an interception to begin a career, breaking Tom Brady’s streak of 163 in a row. Romo knows what it is like to be in Prescott’s situation. Romo was a backup for several years before getting his big chance, and he, just like Prescott, made the most of it. Since beating out Drew Bledsoe back in 2006, Romo hasn’t been challenged for the job. For the next two games, Prescott struggled compared to the numbers he put up earlier in the year. So owner/GM Jerry Jones mentioned the possibility of Romo coming back if Prescott plays poorly again. And to that the rookie responded by completing 32 of 36 passes against Tampa Bay on Sunday and having the second-best completion percentage ever for a quarterback with at least 30 passes in a game. But, more importantly, Prescott removed any doubt that this team belongs to him. 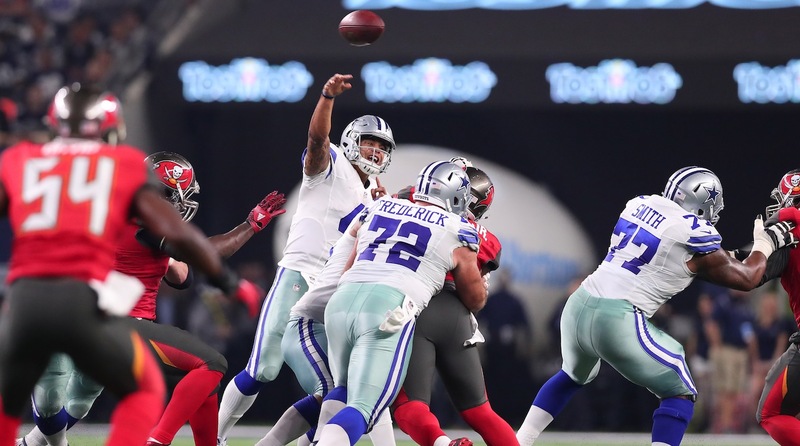 The Cowboys would be undefeated if it weren't for the two games against the New York Giants. Against the Giants, Prescott completed 51% of his passes for an average of 196 yards per game, with one touchdown and two interceptions. In his other 12 games, Prescott completed 72% of his passes for an average of 252 yards per game, with 19 touchdowns and two interceptions. Prescott’s accuracy and his ratio of touchdowns-to-interceptions are nothing short of impressive. And he’s still a rookie! Even though the Cowboys are 12–2, every win has not been a blowout. Seven of the team’s wins have been decided by seven points or less. And they weren't all lucky wins. Prescott is tied for third in the NFL (along with Eli Manning) in comeback wins and is third with five game-winning drives. In most years, Prescott would be a lock for Rookie of the Year. But that may not be the case this year, all because of the guy he hands the ball off to when he’s not throwing it, Ezekiel Elliott, who leads the NFL in rushing. Elliott was the fourth overall pick. Prescott was a fourth-rounder. Together they have helped the Cowboys close in on a worst-to-first season. Elliott’s impact was expected, but Prescott’s wasn't. Prescott will be a force for the Cowboys in the future. It’s easy to picture him holding the Super Bowl trophy on February 7.